Throughout the past decade, some of the wealthiest individuals of the US have been donating large portions of their fortunes to furthering life science research through philanthropy. This has sparked a new wave in private-government R&D cooperation. Historically, government subsidized research has been the major force in advancing basic scientific discovery and innovation. U.S. billionaires with personal interests have donated huge portions of their fortunes to advancing life science research and new technologies for disease prevention and cures. Often benefactor-supported R&D results in the development of new products such as drugs, medical devices and other equipment, and the commercialization of these new products may be eligible for R&D Tax Credits. 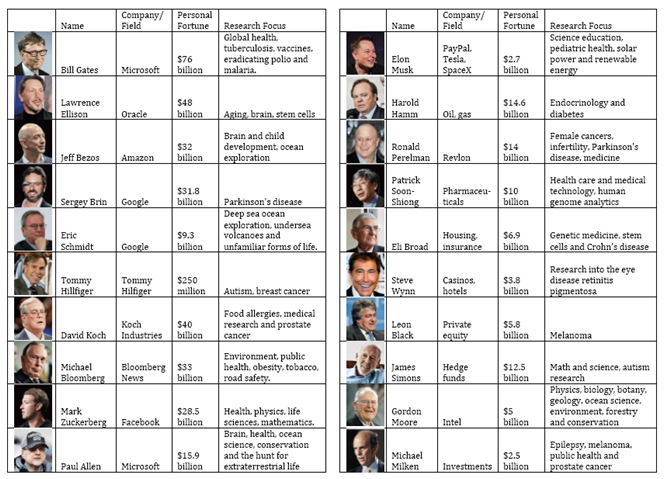 Below is a table which presents some of the most influential benefactors and their selected choice for life science research and advancement. The difference in how money can be allocated with private sector initiative is significant. Many of the people listed above have a personal connection to the illness that they are researching; either they or a loved one suffers from a condition and could benefit from the research. This gives them a focus that would be hard to recreate with a government-sponsored program. Furthermore, they bring management skills honed in the private sector, which can speed progress and apply resources more efficiently. Also, a number of those listed have made their fortunes in the tech industry and have a high comfort level with cutting edge science. Many come from Wall Street, but have a background in engineering and have studied technology. All of this contributes to an approach that has the potential to be very hands-on and centrally driven. Analyzing the chart, there is a fair amount of overlap in areas of interest. Seven are researching public health, three are for ocean science, three are for mapping the brain, two are researching Parkinson's disease, and two are for prostate cancer. Many are pooling funding and working together on the same projects. Of course, government funding for life sciences has not disappeared. In the best cases, private and government funding work together to further the goals of both parites. The National Innovation System is comprised of both government funded and private funded research. Of the 16,000 R&D labs in the US, 12,000 are operated by the private sector. The National Institute of Health, made up of 27 institutes and centers works alongside public universities and private donations to research across a range of medical issues, including cancer studies, heart and lung disease, diabetes, mental health, and neurological disorders. Cancer research has greatly benefited from the structures of private and government funding interplay. The Prostate Cancer Foundation (PCF), founded by Michael Milken and presided over by David Koch, both of whom are diagnosed with the disease, is the world's largest philanthropic funder of prostate cancer research. The PCF has been a major player in providing relief and treatments for sufferers of prostate cancer. Since 2011, they have developed 5 new FDA-approved drugs for prolonging the life of prostate cancer diagnoses, and have supported research for 97 more in current development, working in conjunction with the National Cancer Institute(NCI).v Koch has also donated $100 million to MIT to create the David H. Koch Institute for Integrative Cancer Research, a facility dedicated to developing nanotechnology techniques for treating prostate cancer, with further assistance from the NCI and National Institute of Health (NIH). In addition, Ronald O. Perelman, investor and CEO of MacAndrews & Forbes, has given over $30 million to study breast and ovarian cancer. Working alongside UCLA's cancer research center, his donations led to the development of Herceptin, a drug for treating certain variations of breast cancer. A great example of how the private sector can supplement and influence the government funding can be seen in how research for the brain has progressed. Announced in 2013, a $3 billion US government initiative Brain Activity Mapping has the goal to map the human brain, a goal that could significantly advance human health, psychology and computing systems. This government initiative will be working off of the advancements made by Paul Allen, co-founder of Microsoft, who has contributed over $500 million towards brain research. In 2003, he set up the Allen Institute for Brain Science, which created an atlas for the mouse brain and its internal connections. This information will be a stepping stone for the government funded research mapping the human brain. In addition to addressing the public health issues in the US, many benefactors are turning their attention overseas to combat major health concerns of developing nations. From these, Bill and Melinda Gates have been making an exceptional effort to increase global health, eradicate deadly diseases, and improving overall quality of life. Their Bill and Melinda Gates Foundation, controlled along with Warren Buffett, has contributed over $25 billion to global health with initiatives for vaccinations and research into advanced cures. Furthermore, they have encouraged additional philanthropy from wealthy individuals for charity and research by creating The Giving Pledge, a pledge for the wealthy to donate the majority of their wealth, and which has been taken by 116 people already, many of whom appear in the chart above. Among the initiatives the Bill and Melinda Gates Foundation has sponsored include the development of closed loop free standing toilets, which could sanitarily operate without a plumbing connection. UNICEF estimates that over 1.5 million children die each year due to diarrheal disease, which is a result of open defecation, and it is estimated that over 2.5 billion do not have access to an effective sanitation system. With the initiative launched in 2011, researchers at the California Institute of Technology are supposed to have a product by early 2015. Michael Bloomberg, a champion for domestic public health issues both in and out of office, has recently provided funding for Little Sun, a company which introduced a solar-powered lamp in 2012. The goal is to provide a cheap lamp that would replace kerosene lamps in areas without electricity. The amount of carbon dioxide in the fumes from kerosene lamps are a major health concern in these areas, and especially for children. Bloomberg's foundation estimates that breathing a kerosene lamp for one hour has the same effects as smoking half of a pack of cigarettes. Not only would these lamps improve the quality of life, but they would create a huge improvement in overall public health. With increasing numbers of private funding in life-sciences, new technologies and processes are either underway or right around the corner. Private companies capitalizing on benefactor-supported life science breakthroughs should have an excellent opportunity to utilize the R&D Tax Credit to support commercial product development.